WHEN SAARC (South Asian Association for Regional Cooperation) leaders discuss regional issues in Islamabad in the first week of January, one hopes they will place terrorism on top of their agenda. The menace has become a serious threat to stability in the entire region. Almost every country in South Asia has become the victim of terrorism, though of different kinds. THE state of human rights in a country determines how civilized it is. India can justifiably take pride in its human rights record. Few other countries have as efficient a body as India's National Human Rights Commission. This does not mean that there have been no aberrations. WHEN people leave their native places for sheer survival or in search of better avenues, they are led by “push” and “pull” factors. Their traditional place of inhabitation either pushes them out since no more work or employment is available or they move out on their own to improve their standard of living. THE Congress party is now facing up to an incontrovertible political fact. If it is to be a serious contender for power it will have to forge complicated political alliances across India, as it feels now. But crafting alliances is a delicate game, not the one the Congress is very adept at. Its alliances will yield results only if it keeps in mind the fundamentals of alliance politics. Here are some. BABUR, the founder of the Mughal empire in our country half a millennium back, once wrote that the only things good about “Hindustan” were that it was a big country and it had plenty of gold. Otherwise, it was "a country of few charms". In line with this, what one could safely say today is that the only thing good about the Indian Government is that it is a source of livelihood for a vast number of people. THE last one year of the BJP-led National Democratic Alliance (NDA) has been marked by an intense struggle between ideology and “realpolitik”, precipitating the beginning of the process of realignment of political forces. BJP leaders in charge of assembly elections in Madhya Pradesh in particular insisted that they had made a conscious decision to steer clear of the Ram Mandir issue and other matters connected with Hindutva. WHEN SAARC (South Asian Association for Regional Cooperation) leaders discuss regional issues in Islamabad in the first week of January, one hopes they will place terrorism on top of their agenda. The menace has become a serious threat to stability in the entire region. Almost every country in South Asia has become the victim of terrorism, though of different kinds. India has been pleading for a collective drive against the problem time and again but in vain. Pakistan, which is at the receiving end today, has always thwarted any collective regional move against terrorism. One expects a change in Pakistan's attitude in view of the kind of situation it faces itself. The time has come for the SAARC nations to formulate a joint strategy to stamp out terrorism so that they can devote their energy to the development of the region. The SAARC leaders vowed to fight the menace in all its manifestations at their 2002 Kathmandu summit, which was otherwise overshadowed by the chill in the India-Pakistan relations. In 1987, they signed the SAARC Regional Convention on Suppression of Terrorism. Yet nothing happened beyond these pious declarations. Unfortunately, no country has ever cooperated with India like Bhutan has done lately in eliminating the camps the terrorists had established in its territory. Behind the SAARC failure to act decisively against the monster has been Pakistan's approach to terrorism in Jammu and Kashmir. The terrorists have not only been allowed to use Pakistan's territory and that of PoK but have also been given all kinds of support to carry on their destructive activities. The reason: infiltration of terrorists has been a part of Pakistan's Kashmir policy. These terrorists and those of the Al-Qaeda and Taliban varieties now seem to have turned their guns on Pakistan, particularly Gen Pervez Musharraf, following his decision to be on the right side of the US after Nine Eleven. The Islamabad summit provides the best opportunity to the General to change tack and cooperate with the rest of the SAARC nations to launch a collective and decisive drive against the common threat. THE state of human rights in a country determines how civilized it is. India can justifiably take pride in its human rights record. Few other countries have as efficient a body as India's National Human Rights Commission. This does not mean that there have been no aberrations. But whenever human rights violations were brought to the notice of the NHRC, it had taken a bold stand forcing the authorities to take remedial actions. A civilized nation cannot afford to ignore the scope for abuse of human rights. It is in this context that the NHRC's demand to review the Protection of Human Rights Act assumes importance. Under the Act, the NHRC is not empowered to look into complaints of human rights violations by the armed forces. What is worse, the definition of “armed forces” is so elastic that all armed forces of the Union are covered by it. In other words, a large number of military and paramilitary forces are outside the purview of the NHRC. Exemption is given to these forces as they are supposed to have their own institutionalised mechanisms to prevent such violations. However, the inbuilt mechanisms have not prevented complaints from reaching the NHRC, which cannot do anything in the matter. It is now two years since the commission suggested in vain certain amendments in the Act. The irony is that whenever human rights organisations criticise the country, the government promptly points out the existence of the NHRC to blow its own trumpet. Yet, it is not prepared to strengthen the hands of the commission. By virtue of their posting in trouble-torn areas like Jammu and Kashmir and the Northeast, the armed forces have to deal with civilians on a day-to-day basis. In such situations, some of the jawans taking the law into their own hands cannot be ruled out. Unfortunately, there is a tendency to condone such misconduct on the ground that they work under strenuous conditions. This only causes disrepute to the country and strengthens the anti-India propaganda by those inimical to it. WHEN people leave their native places for sheer survival or in search of better avenues, they are led by “push” and “pull” factors. Their traditional place of inhabitation either pushes them out since no more work or employment is available or they move out on their own to improve their standard of living. Poor people from relatively less developed states like Uttar Pradesh, Bihar, Orissa and Rajasthan come to better-off states like Punjab and Haryana to take up work which local youth are reluctant to do either for its being arduous or low paid. Punjabis mostly leave the warmth of their home in search of a more comfortable life abroad. By taking up leftover jobs, migrants fulfil a gap and contribute to the economy of the area where they settle down. A little clash of interests with local people is natural. But at times it can flare up, leading to violence, as it happened in Maharashtra and Assam recently. The resultant social tension is often due to misinformation or is motivated and exploited by mischief-makers. There is a misgiving that migrants are behind the recent incidents of crime. The fact is, as the Director-General of Police, Punjab, points out, that poor daily-wagers do not commit such crimes. There are criminals who could be coming from outside and going back to their areas after the crime. Earlier, migration was seasonal as outside labour came at the time of sowing or harvest of rabi and kharif crops; now migrants are settling down, changing the demographic profile of the state and causing worry to some sections of society. Hence, there is a demand that migrants should not be allowed to vote or buy property in Punjab, and that their influx should be checked. In this age of globalisation such views are ridiculous. There is, however, need for their registration as provided in the Inter-State Migrant Workers (Protection) Act, 1979, to help government agencies and civic bodies to provide for housing and other amenities. Also, law permits a citizen to have the right to work anywhere in the country. There is another law: the jobless go where work is available. When a friend asks, there is no tomorrow. First, there must be a genuine confluence of interests among partners. Alliances are stable only to the extent that it is a win-win situation for all partners, where none has to gain by defecting. On this front, the BJP has had an easier time with alliances because its regional concentration did not put it in direct competition with election partners. The Congress will have to make difficult choices. For example, should it ally with the SP or the BSP in UP? The advantage of an alliance with the SP is that unlike the BSP, the SP is not aiming to be a major political force in other states significant for the Congress, so there will be fewer direct conflicts over seat adjustment. On the other hand, even a 7 to 10 per cent vote for the BSP in key constituencies in states like Madhya Pradesh and Rajasthan has the potential of acting as a spoiler for the Congress. The strategic question is: Will the Congress lose more seats by not aligning with the BSP than it will gain by aligning with the SP? The Congress’s long-term viability will require attracting Dalit votes, but if it cedes this territory to the BSP by not competing against it, it will cut its own long-term base. Second, the effect of BSP attrition is possibly exaggerated in states other than UP; the Congress has to fear its own rebels more. Third, the BSP is, if the crunch comes, somewhat more likely to jettison the Congress even for the BJP. Mr Mulayam Singh Yadav may go for a third front, but it is difficult for him to ally with the BJP. Hence an SP-Congress tie-up is likely to be stable. If the Congress plays its cards right, it may attract both a formal alliance with the SP and some seat adjustment with the BSP outside UP. In Bihar, the Congress has little choice other than Mr Laloo Yadav. But it will be tricky to manage him: the Laloo-Mulayam equation is not exactly stable, and the irony may turn out to be that the Congress will ally with Mr Laloo Yadav when he is most vulnerable. But the Congress has few options in Bihar. Similarly, the DMK versus the AIADMK is a toss-up, but it is more likely that the DMK will function better with the Congress. But the important thing is to have a clear understanding of the competing interests at the front so that the incentive to defect is reduced later. The second ingredient of an alliance is a common minimum programme. We often scoff at political promises as being empty gestures, but a common minimum programme can at least draw some boundaries on the subjects that are on the agenda and can delineate clear lines of authority. The ideological distance between the Congress and any of its alliance partners is not very great to make this an insurmountable obstacle. The bigger obstacle will be the Congress’s own confusions about where it stands. But a CMP also sends a signal to voters that an alliance is a product of forethought and is workable. The Congress will have to overcome the suspicion that its alliances are largely whimsical. The third ingredient of an alliance is a clear understanding of how post-election spoils might be shared. This is again more difficult for the Congress than the BJP for a number of reasons. The BJP worked on the assumption that the Centre was firmly its own. Its allies were given a clear hand in their own states, given concessions from the Centre, but were never really allowed to compete with the BJP at the Centre. This was made possible by the fact that a significant alliance partner, the TDP, was self-restrained in asking for open political spoils at the Centre, and the Samata was an odd combination of infighting and Vajpayee loyalism. Can the Congress work out an arrangement where its allies see advantage in self-restraint? The difficulty is two-fold. First, the Congress is dealing with the parties that, unlike the TDP, have inflated expectations and are likely to sulk more often. Second, the Congress’ own second tier leadership does not command the kind of unquestioned authority the BJP’s does. They are easier to challenge than their counterparts in the BJP. The Congress and its allies will both have to learn that in alliance politics sometimes less is more, as the TDP has shown. Finally, the biggest challenge for the Congress is the leadership question. Mrs Sonia Gandhi might be acceptable to many allies, but she is miles away from exercising the kind of authority Mr Vajpayee commands in more ways than one can list. This has the consequence that more of the Congress allies will harbour bigger ambitions than the BJP’s allies do. Alliances often need tremendous personal equations to get them over the rough patches. Mrs Sonia Gandhi is not communicative and charming in the way Mr Vajpayee can be. Nor does the Congress, on the face of it, have leaders like Mr Pramod Mahajan who can oil the alliance wheels as it were. The only way of compensating for this lack is again by a clear understanding of mutual interest in alliances and a politics that jettisons inflated expectations. But it will be imperative for an alliance to agree upon and stand firm behind its Prime Ministerial candidate with inordinate zeal. Anything less will impugn its own authority. There is an old joke that the Congress’s biggest challenge is to forge an alliance with itself. This includes not just the extraordinary number of Congress rebels who routinely spoil the party, but also erstwhile Congress factions like the NCP. Consolidating this natural Congress vote will be the biggest challenge for the party and will require immense institutional regeneration and micro-management at all levels. The Congress often forgets that elections are fought in constituencies, not in Delhi, and its seat allocations will have to be premised upon a constituency-wise analysis of its strengths and weaknesses. A party that cannot control its own state units is unlikely to be able to deal with allies from a position of strength. The Congress will grow by entering into alliances only if it takes seriously the art of winning friends and influencing people. BABUR, the founder of the Mughal empire in our country half a millennium back, once wrote that the only things good about “Hindustan” were that it was a big country and it had plenty of gold. Otherwise, it was "a country of few charms". In line with this, what one could safely say today is that the only thing good about the Indian Government is that it is a source of livelihood for a vast number of people. In addition, one can also take pride in the fact that this is the place where donkeys, horses and the racehorses are all treated alike in the high traditions of a socialistic society. I was then an Army Captain posted as a personal staff officer to a Brigadier who commanded four artillery regiments. One of regimental commanders felt, at one point of time, that he had already worked quite hard and was due for some rest. When he insisted on persistent headaches, he automatically became a case for checkup for brain tumour in our Base Hospital and consequently, due for a prolonged rest there. My Brigadier always wanted me to keep a track on his treatment. Even now I am not sure whether he was genuinely interested in his welfare or wanted to catch him for malingering. Perhaps, it had some thing to do with both. Anyway, once when he enquired about the Colonel's condition, I innocently explained that an X-ray was taken of his skull and nothing was found inside. I was immediately up for a high jump for missing on the word “abnormal”, but the Colonel also did not prosper. Unfortunately, the armed forces are the one wretched area where donkeys and horses etc. get segregated fairly soon. Nonetheless, when another high profile friend of mine was in a “to be or not to be” state of mind, while facing a violent mob, this genius gave him a rather simple Bacon-like advice, " if in a situation your mind is absent, so should be your body". The valuable advice was again not taken, but I still often feel puzzled whether it was not at least worth a look. 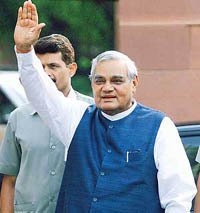 While a section of the Rashtriya Swyamsevak Sangh (RSS) and its allied organisations like the Vishwa Hindu Parishad (VHP) tried to dictate its ideological agenda to the NDA government, the other section led by Prime Minister Atal Bihari Vajpayee succeeded in marginalising the ideology baiters and, in the process, projected good governance as the main issue for people’s consideration. Obviously, it was no easy task as the Sangh Parivar had been emboldened by their electoral success in Gujarat where Mr Vajpayee had practically been forced to sacrifice his conviction for electoral gains. Slowly but surely, he regained his confidence as he was assisted by Deputy Prime Minister Lal Krishan Advani who worked overtime to keep the party machinery well oiled and geared up for the challenges. Working on the thesis that it was the BJP which was the centrifugal force in the NDA, Mr Advani did not allow his personal ambitions to cloud the overall direction of either the BJP or the NDA ship so that the cementing force of power remains intact with the ruling combination. The BJP’s victory in Madhya Pradesh, Rajasthan and Chhattisgarh elections has reinforced not only the authority of Mr Vajpayee in the NDA but also of the BJP in the conglomeration of political parties. The trend that began with the BJP victories in Goa and Gujarat last year continued this year too as the ruling party jumped in to the electoral fray with unprecedented aggressiveness. The BJP’s campaign managers were doubly successful in giving a crushing defeat to the Congress. An unfortunate precedent was set this year when Arunachal Pradesh Chief Minister Gegong Apang crossed over to the BJP giving the ruling party an opportunity to claim that it has presence in the north-east too. This development made BJP managers more confident. The year also saw the start of the realignment of political forces when two constituents of the NDA, namely the Janata Dal (United) and the Samata Party decided to merge as their top leaders of the two parties felt that their bargaining clout would immensely go up vis-a-vis the BJP. But then, middle ranking leaders, apparently, did not share the perception of the leaders and decided to engineer a split. Even the DMK’s exit from the NDA has not dampened the BJP spirits as the party managers are sure that the “feel good factor” will help the ruling coalition to emerge victorious in the Lok Sabha polls. The BJP leaders and managers are sure that many political parties would be ready to jump into the bandwagon when their leaders would start perceiving that the NDA was a winning combination at the general elections. The lure of power would break many ideological barriers as is being indicated in the case of the Samajwadi Party (SP) of Uttar Pradesh Chief Minister Mulayam Singh Yadav whose covert understanding with the top NDA leadership has become the talk of town. The long-term and deep-rooted understanding between the Nationalist Congress Party and a section of the BJP has been put to constructive use to further the cause of good governance but even here lie the seeds of future alliances at the Centre and in the states. The NCP and the SP’s role in the defeat of the Congress in the Assembly elections in Madhyta Pradesh, Rajasthan and Chhattisgarh was only a tip of the iceberg as their understanding with the BJP runs deep. Another interesting feature is the NDA’s ties with the ruling Telugu Desam Party in Andhra Pradesh whose leader Chandrababu Naidu has been cleverly using his unique position to further the state’s interests while at the same time protecting his ideological base. But then, the DMK’s exit also suggests a possible realignment of forces in Tamil Nadu as the MDMK refused to follow suit. Chief Minister J. Jayalalithaa is not yet publicly acceptable to the BJP, but the TDP model may emerge as a working solution. With the Lok Sabha elections likely to be advanced by a few months, the NDA is likely to face some problems as constituents like the Indian National Lok Dal, which won five Assembly seats in Rajasthan would demand their political price by asking for more Lok Sabha seats. As the elections draw close, the tussle between the BJP and other NDA constituents is expected to intensify but the former has an upper hand as Mr Vajpayee continues to remain a rallying point. The NDA may have more partners or even less but the BJP would remain the leading force. Unlike the time of formation of the NDA when the BJP was looking for allies and friends, the situation is just the opposite now. The NDA has all the cards in its favour as the Opposition is in total disarray with the main party, the Congress, being unable to get allies and others either having a covert understanding with the BJP or not powerful enough to be politically relevant. This could well set the party’s agenda in the 2004 general elections following the overwhelming response to its gambit in both Madhya Pradesh and Rajasthan. The key to elections are no longer the core issues of Hindutva but ground realities. The groundswell of anger especially in Madhya Pradesh was evident against the Congress and ousted chief minister Digvijay Singh in particular. The BJP leadership had also impressed upon Uma Bharti to focus more on problems afflicting the masses as her saffron robes amply conveyed her ideology which did not require added emphasis day in and day out. Andhra Pradesh Chief Minister Nara Chandrababu Naidu is in a tizzy as he is not sure if assembly elections in the state will be held in March. That puts him in a Catch-22 situation as any delay can affect the sympathy factor for him and his Telugu Desam Party especially after the attempt on his life by the People’s War Group in October. He is also highly uncomfortable with the movement for a separate Telangana state gaining ground. dealing with the problem of Naxalites as a law and order issue rather than a socio-economic one impeding development has fuelled the demand for a Telangana state as a means of overcoming its backwardness. Scribes readying themselves to go to Islamabad for the January 4-6 summit of the South Asian Association of Regional Cooperation (SAARC) were stymied by the advisory that mobile phones from India do not work in Pakistan. This comes at a time when India and Sri Lanka are on the verge of having direct mobile connection. It is only recently that the ban on mobile phones in Jammu and Kashmir has been lifted. At the same time, militants who had infiltrated deep into Jammu and Kashmir were merrily talking to their masters across the border as evidenced by intelligence intercepts. The advisory had one sentence on the use of mobile phones which read “mobile phones from India do not work in Pakistan.” Scribes were talking of buying a SIM card to facilitate them while in sanitised Islamabad. Will that be possible in a high security zone with policemen keeping a watch on Indian mediapersons? Agony and ecstasy — the Indian economy has it all. First, the ecstasy. The forex reserves have crossed $ 100 billion. For a nation being on the verge of a major financial default just about a decade ago, this surely reflects a situation of plenty. But as an expert quipped, the basic issue of poverty remains largely unaddressed. There may still be a long way to go as otherwise we would not have a situation of people dying due to cold wave. And as a wag quipped: the Finance Minister’s index of Gross National Contentment (GNC) is rising at a painfully slow pace and the forex reserves may remain as mere statistics of plenty without fighting the scourge of poverty. Forest brigand Veerappan has been dodging the Special Task Forces for several years now, but the Central Reserve Police Force (CRPF) Director-General S.C. Chaube believes that he is a small fry for his force. “For us, Veerappan is a very small fry,” said Chaube at the annual press conference of the CRPF. Last year the CRPF had requested the Central government to entrust it with the job of apprehending the sandalwood smuggler, who has been defying the joint operations of Tamil Nadu and Karnataka governments. However, Mr Chaube preferred not to comment how “a very small fry” like Veerappan continues to be so elusive from the long arm of the law? I salute Him whose effulgence is equal to the light of many crores of suns and moons risen together, who is invisible, who is neither heat nor cold, and who is pure knowledge as such. The Christian life is not merely knowing or hearing, but doing the will of Christ. Freedom is the goal...it is freedom alone that is desirable. That is what men struggle after. Prema means such love for God that it makes a man forget the world and also his body, which is so dear to him. Chaitanayadeva had Prema. He is no good Christian who thinks he can be safe without God, or not safe with him. The body is the palace, the temple, the house of God; wherein He has put His infinite light.